vilros has no other items for sale. There are 442 items available. Please enter a number less than or equal to 442. Good to go, very fast shipping and well packed. Thank you! Great transaction! All as described, arrived fast! Thank you! Great Kit for mini projects. Fast Shipping. A+. This thing was a piece of crap. Don't work correctly and takes forever to load. 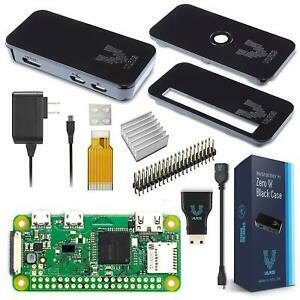 Vilros Raspberry Pi Zero W starter kit is the best value around for what you get! All you need to add is a SD card with your favorite Raspberry OS and you are good to go. While you could get by with plugging and unplugging a keyboard or mouse, I'd recommend either a powered USB hub or using a Bluetooth mouse/keyboard. Once it's up and running, you could also set it up with VNC to use it via wireless network using the VNC client on your PC, Mac or Linux. Nice looking case (better than the official Raspberry case, IMO! ), comes with three tops depending on your use, and the kit also includes the camera cable and a 40-pin GPIO header. While not quite powerful enough to use as a desktop replacement, it's a good place to start for learning about programming a Raspberry Pi and a good controller for LOTS of projects! This is the best and cheapest starter kit.